It's not a fun place to start. After creating a series of tests (120 in total), only 24 passed and it took 3 hours and 46 minutes to run. No, these aren't simple unit tests. Something would be very wrong if they were. These are complex integration, end-to-end system tests. 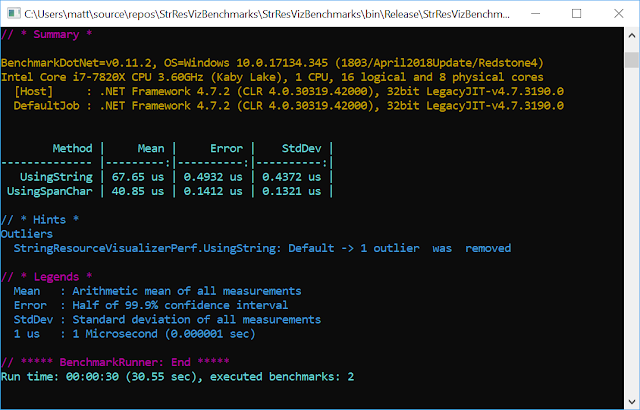 These tests relate to Windows Template Studio and verifying that apps generated with different frameworks (CodeBehind, MVVMBasic, MVVMLight, Caliburn.Micro, and Prism) all produce the same output. 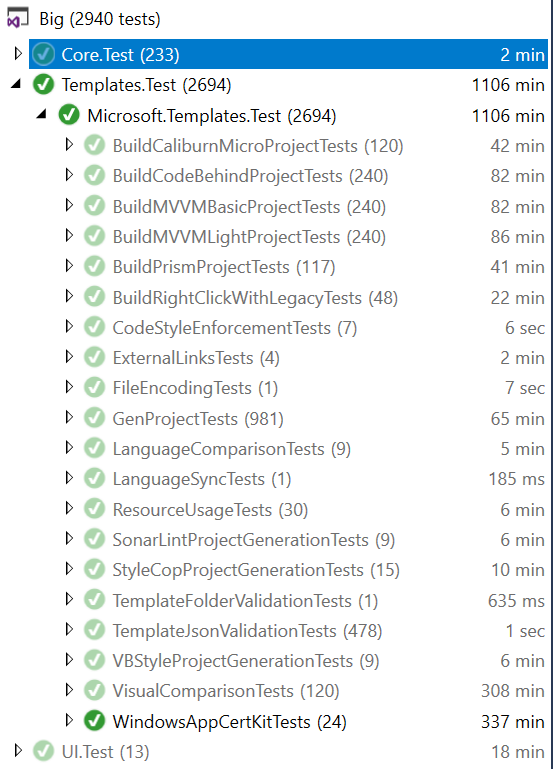 I already have separate groups of tests which check equivalent apps created in C# and VB.Net produce the same result. I also have tests which compare functionality and output at a passive, static level but I suspected there was potential value in running the generated apps and checking them too. When creating templates, the MVVM Basic version is usually created first, so this became the reference version. Generate an app with the reference framework, specified nav type, and just the specified page. Generate apps with each of the other frameworks using the same nave type and page. 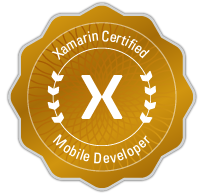 Install the temporary certificate created with the app and used to sign it. For each of the other frameworks. Create a new test project. Update the project to have references to the reference app and the comparison app. Maximize the app once opened. If all screenshot images are identical. Delete the apps and test projects. If screenshot images are not identical. Create an image highlighting the differences. Leave all artifacts created during testing to help investigate why the test failed. See, not a simple test. Originally I had separate tests for each comparison but changed to the above approach to reduce the number of times the reference app needed to be created. The details in the failure message meant that having separate tests didn't help with debugging at all. Also, the ability to run individual tests and customize the reference frameworks meant that I could avoid unnecessary work when verifying specific fixes. The good news about all this work is that it did find some issues with the generated projects and fixes have been made. Having known test suites that take more than 5 days to run in their entirety, I have strategies for managing long-running test suites. Running all the tests in this solution takes over 18 hours, but the long-running ones are only run manually before a release and many can are normally run in parallel. No, we don't run all the tests, all the time. 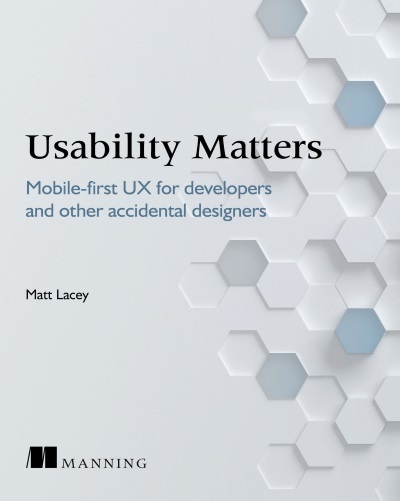 A notable extra lesson from these new tests was that page layouts behave differently for an app that is opened and then maximized and apps that are opened maximized. Seriously. It's potentially concerning but I have more important things to focus on right now. Today I had a lot of potentially tedious and error-prone work to do regarding changing some long string constants within some unit tests. The tests (among a few other things) compare multi-line generated strings. All had been good while it was only running on Windows, but now it needs to run regardless of the line-endings in use. This meant that everywhere there were implicit, multi-line strings, tests were failing. The solution was to change all the tests so that they worked regardless of the line-endings of the machine they are running on. To make this easier for me I created a tool. It's probably easiest to show what it does. It's a C# analyzer that makes changing multi-line strings to use environment appropriate line-endings much simpler and without the risk of manual error. Just two clicks and it's all converted for me. And as I did this in 100's of places, even with the time spent creating the analyzer the conversion process was much quicker. The chances are you'll never need it but if you have to do something like this is future it's here for you. When I say here, I, of course, mean on GitHub. Or you could install it as a NuGet package. I want to help make it easier to get started with UWP development. In terms of the tools available to help UWP developers, there are two challenges. 1. Knowing what tools are available to help with development. 2. Getting everything available installed. Visual Studio 2017 version 15.8 introduced new functionality to help with this. It's called Extension Packs and is a way to create an extension that bundles (or packs) together a number of other extensions. So I made one for UWP developer tools. Consider it a one-stop shop for setting up your machine for UWP development. You can be new to UWP development or just want an easy way to make sure all the useful tools are installed. I've published this myself, even though I'm not responsible for all the packages, but I'd love for this to be a community-supported resource and so I'm keen to hear if you have suggestions for other extensions that should be included as well. 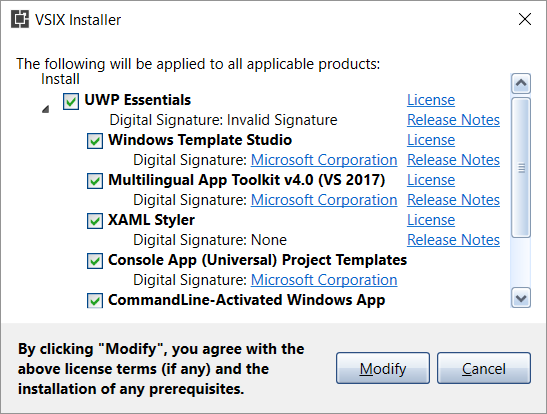 Even if you don't want to install all the included extensions you can unselect what you don't want when you install. You'll need to be using Visual Studio in version 15.8 or above for this to work. Go get it from within VS or from the marketplace. If you have suggestions for other tools that should be included raise an issue on GitHub. I was asked on Twitter , regarding String Resource Visualizer, whether "using Span for string operations [will] make it faster?" My inclination was that potentially it would, but at a cost of code readability and I wasn't sure if it really needed the optimization. Also, I'd read a bit about Span<T> when it was first announced and it all seemed very complicated and abstract. I assumed that it was more for low-level things and I could happily ignore it. It nagged me though that the String Resource Visualizer was doing a lot every time the text of the editor window changed in VS. Yes, every time the screen is scrolled or the text changes. That's a LOT! In theory, any perf improvements would be a good thing as they could improve the UI responsiveness of Visual Studio. If someone had a slow or low-powered machine this could be important. Today I had some time on my hands while installing some updates over my disappointingly slow internet connection. So I did some more research on Span<T>. It turns out it's not as complicated as I thought so I decided it was worth investigating what, if any, improvement could be made from the change. Because the actual code has some coupling that doesn't lead to easy benchmarking, I created a version of the important part of the code in a separate, console, app. 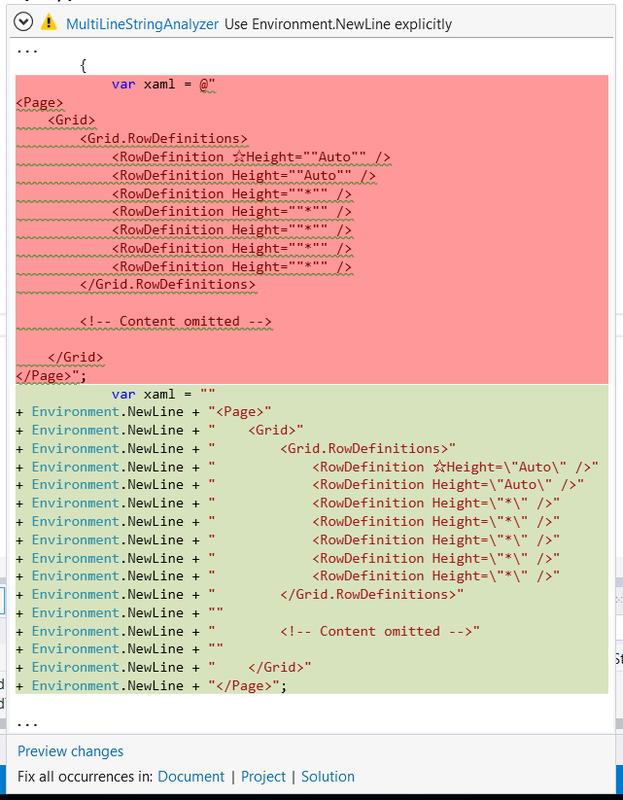 I then created another version that used ReadOnlySpan<char> instead of a string as much as possible. Cutting to the chase, here are the results of the benchmark test. Not using string was about one-third faster, but that's only approx. 27 microseconds. Proportionally that's a lot but in real terms, not so much. - Making the code faster could be really important given that it potentially runs on every keystroke. - It's not a lot of time though and no-one is complaining about performance. Could this be an unnecessary micro-optimization? - There are other parts of the code when a definite performance improvement could be made by reducing IO. This seems a higher priority. - Having spent years writing code that does string manipulation, I'm not yet ready to jump into making changes that will affect the readability of the code. I'm going to wait and reflect on this before deciding what to do next. If, like me, you work with code that contains placeholders (generated static properties) for localized resource strings (from .resx files), a codebase that contains a lot of these can be harder to work with than feels necessary. It can take longer to read as you have to look up what the placeholder represents and it's easy to use the wrong placeholder. This is the scenario I encountered last week. What if there was an extension that could show the text of the placeholder too? I looked for one but couldn't find anything. Then I wondered. After a couple of hours of experimentation, I had the bones of something working. I posted a screenshot on Twitter to see what others thought. I sometimes find it hard to work with code that contains a lot of resource strings, so I made an extension that shows the actual text too. Based on the positive response the tweet received, I've put something more formal together. Much like the screenshot in the tweet, it allows you to see the default text for a string resource above where it's used in your C# code. The code is on Github and you can download the installer from the VS Marketplace. Got get it now and try it out. There are a couple of known issues that I hope to address soon but I'm keen to hear any feedback or other suggestions for improvements.